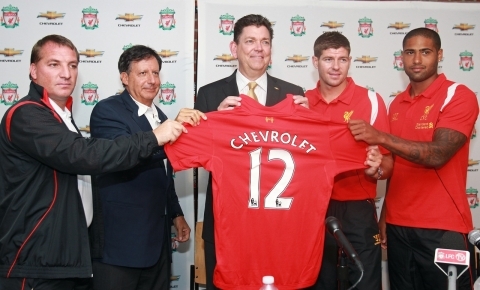 SEOUL--(Korea Newswire) July 25, 2012 -- Chevrolet today announced that it is entering into a four-year partnership agreement with Liverpool Football Club to become its Official Automotive Partner. The partnership runs to the end of the 2015/16 Barclays Premier League and European campaigns, and includes visibility for the brand at Anfield, Liverpool’s home ground; editorial opportunities within the Club’s print and digital publications and fan sites; and player appearances for commercial opportunities. 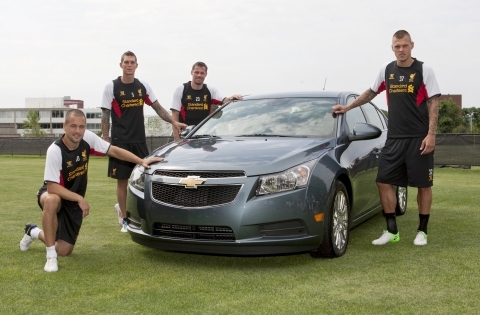 Chevrolet is also an official sponsor for the Club’s Pre Season Tour, one of the most popular in the world, which has already seen Liverpool play Toronto FC last Saturday. Liverpool will play Italian giants, AS Roma tomorrow at Fenway Park in Boston and on 28 July they will play English Premier League rivals, Tottenham Hotspur in Baltimore. Ian Ayre, Managing Director of Liverpool Football Club said: “Much like our Club, Chevrolet has a long, rich history with a growing, global brand and this landmark partnership once again demonstrates the value of Liverpool's international appeal. For more information about the LFC North American Tour 2012 and to purchase tickets, visit www.lfctour.com.